Short copy: Brewed with natural ingredients and Rocky Mountain water to create a legendary, full-flavored taste that’s worth seeking out. Body Copy: What drives a man to stash a transport Coors in his suitcase, car or official jet? How could one beer inspire such extremes? It began when the quest for the perfect brewing water led a 26-year-old brew master to the heart of the Rocky Mountains. His resulting Banquet brew ignited a legendary Coors obsession among enlightened beer drinkers that lasts to this day. Sure, it’s easy to love, but it wasn’t always easy to get. Savor how good you’ve got it. 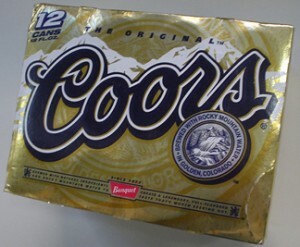 You’ve got a Coors in your hand. This entry was posted in Packaging by gucky. Bookmark the permalink.